'Janet Craig' is one of the few plants that have taken on the name of a cultivar as a common name. 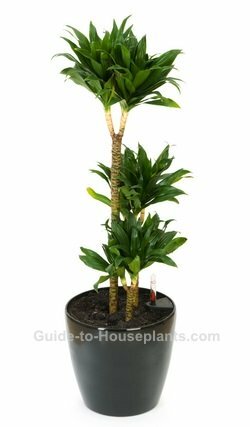 But then, few are as easy to grow and welcome in the home as this attractive Dracaena plant. Its dramatic form makes a striking floor plant. "Janet" is well worth getting to know. Although tropical by nature, it adapts beautifully to average home conditions. In fact, it does so well on its own, you don't need to fuss over it at all. Young plants are a tuft of upright leaves. As the plant grows, it forms a cane-like stem with a cluster of leaves at its top. Its dark-green leaves are naturally shiny. Because of their upright form, they can be dust-catchers. Keep the leaves clean by wiping them off with a damp cloth. Prune it back if it grows too tall. If you want, you can propagate the stem cuttings for more plants. Pruning tip: Prune in spring or early summer to control its growth. You can cut off the cane at any height. It will sprout a new cluster of leaves from where it was cut. Repot in spring only when the roots have filled the pot. Young plants may need repotted every 2-3 years. Use a pot with a drainage hole to prevent overwatering. Problems with this Dracaena are few. Watch for webbing between leaves. Spider mites may attack during the winter months when the air is dry. Unfortunately, they're difficult to detect until the infestation is severe. Treat your plant right away with insecticidal soap. Dropped leaves are likely caused by soil that's either too wet or too dry. Water thoroughly to wet all the roots, then allow soil to dry slightly before watering again. Brown leaf tips indicate dry soil or a build up of soluble salts. Soluble salts come from the chemicals in tap water and fertilizers and can damage foliage and roots. It's a good idea to flush salts from the soil every year. How to Flush Salts: Take your plant outdoors on a warm day (keeping it shaded from direct sunlight). Slowly pour lukewarm water over the soil. Allow water to drain out the drainage holes. Pour more water through the pot, then empty the drainage tray. Flushing salts every a year will make your plant healthier and takes only minutes to do. 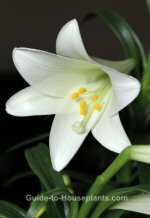 Look for the cultivar 'Janet Craig' to be sure you're getting this plant. Other dracaena species look similar. D. deremensis 'Compacta' is a much smaller variety that only grows to 2 ft (60 cm) tall. Light: Moderate to bright light. Keep plant out of direct sunlight which can scorch its leaves, leaving brown marks. Pale leaves can indicate that light is too low. Water: 'Janet Craig' Dracaena will tolerate many abuses, but not soggy soil. Water thoroughly, allowing the top inch (2.5 cm) of the soil to dry out between waterings. Water less in winter, when light levels are lower and growth has slowed. Use a pot with a drainage hole to prevent wet soil. Overwatering will cause leaves to turn yellow and fall off. Humidity: 40-60% relative humidity. Discover easy ways to increase humidity for your houseplants. Fertilizer: Feed monthly year-round with a balanced liquid fertilizer diluted by half. Propagation: Take 4 in (10 cm) stem tip cuttings in spring and root them in moist soil.